It seems so big... granted its about a third of the size of our neighbors' but huge compared to the 2 pots of tomato plants we did last year! I'm am no expert in gardening, far from it in fact, so I don't have high hopes. I'm trying to at least track what we do and try figure out what doesn't work so we can improve next year. This will be a learning year for me. 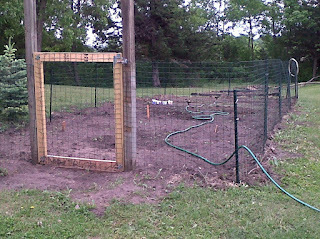 My wonderful husband built a fence and gate for the garden. It seemed like a lot of work but our neighbors have had lots of trouble with deer and raccoons in their garden in the past so we followed their advice. Luckily he was able to use posts and wood that was left over from other projects or left behind by previous homeowners to keep costs down. So far the garden has peas, carrots, onions, beans, squash, cucumber, zucchini, and pumpkin. I still need to transplant the plants we started early and buy some tomato plants. It has been fun to have a little helper in the garden. His favorite job is watering.... and playing in the water! I'll try to report back on how the garden turns out a few times this summer... Let the adventure begin.